For many startups, creating the educational platform (and learning experience) of the future began with reinventing the presentation, distribution — really, the essence — of educational content. And what is the most familiar package for that content? The good ole textbook, in all its rigid and bulky glory. As such, startups like Kno, Inkling and Boundless have been helping to make textbooks and learning content digital, interactive and personalized. Of course, generally speaking, these startups have had to fight tooth and nail against the incumbents of the space — the controllers of content — the big, bad publishers. Self-publishing platforms and open content resources have grown in popularity and startups have begun experimenting with new ways to present learning material, all of which has threatened the old guard, forcing them to make moves. Adapt or go the way of the dinosaur. Although they’ve been known to stand in the way of innovation. This morning, textbook publishing giant, McGraw-Hill, showed that it’s been taking these changes seriously and may just be ready to play ball. Not your average CES startup, the company unveiled its new suite of interactive and adaptive learning products that aim to personalize the learning process and help students improve their performance. Traditionally, adaptive learning tech has focused on study tools, but with its new suite, McGraw-Hill is looking to go beyond that to create a fully adaptive course. The company launched its own study tool, LearnSmart, back in 2009, which gives its new products the advantage of a ready-made user base and a ton of data to work with thanks to its one million unique student users, who have answered more than one billion questions to date. While the suite will include products like a “before-the-course” adaptive resource (that lets students warm up before difficult classes begin), a “photo-realistic virtual lab” and a comprehensive adaptive learning system, the stand-out was its unveiling of SmartBook, an adaptive eTextbook for laptops, desktops and tablets that adjusts to students’ comprehension and speed as they go. It’s not quite the Textbook of the future, as the experience is comparable to reading your average textbook, but it’s a clear sign of which way things are going. Instead of having to quiz yourself, your SmartBook will assess your knowledge as you read, highlighting content and concepts that students need to master. In fact, the book will actually talk to you, offering voice instructions and coaching students on the most effective way to read the material. If they answer incorrectly, it guides them to the material they need to re-read. Pretty cool. 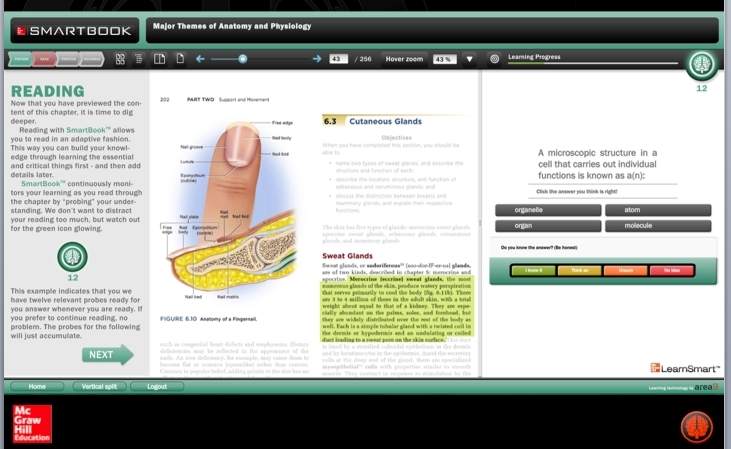 McGraw-Hill says that it expects to launch its SmartBooks this spring on Mac, PC, iOS and Android. Collectively, the SmartBooks will cover 90 different subject areas and cost $20 and up (per book). From what we’ve seen, the product isn’t the sexiest out there, but it does make good use of innovations in digital textbooks like those we’ve seen from Kno and Inkling, offering dynamic text and, unlike the others, voice instruction. To be sure, it’s a space that’s becoming more crowded and competitive, with Pearson employing Knewton’s adaptive learning technology to upgrade its digital learning tools — and Wiley, for that matter. What’s more, it will be interesting to see what the launch of McGraw-Hill’s SmartBooks means for relationships it has with startups like Kno, which has been helping to digitize the publisher’s textbooks and make them more interactive. McGraw-Hill instead turned to its adaptive tech partner Area9 to help it develop its SmartBooks. Not to be outdone by its publishing partner, Kno announced a new product today at CES as well, unveiling “Kno Me,” a personal study dashboard that helps students monitor their progress as they read. 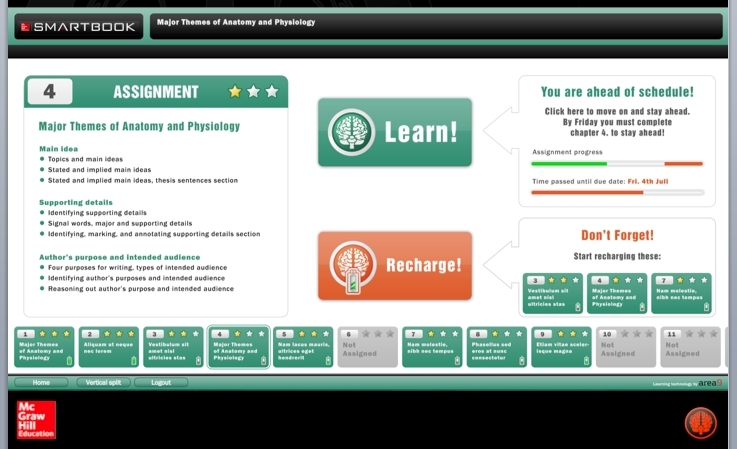 The dashboard allows students to check-in to view realtime stats on their study behavior, time management, interaction levels and progress. Users can then share these results with peers or follow the engagement levels of their peers. The product will complement Kno’s interactive, digital textbooks, which now span over 200K titles and contain content from 65 of the top publishers. The smart textbooks offer more than 70 interactive features designed to boost engagement and help students reduce the amount of time they spend studying by improving efficiency. With Kno Me, the startup is trying to take that efficiency one step further by giving students deeper insight into their reading habits. Kno Co-founder Osman Rashid says that the idea is really to help students answer the question, “how much am I really studying?” Generally, the only assessment in this regard is a grade, and by that point, it’s generally too late anyway. It’s not exactly adaptive learning, but it does personalize and add granularity to the learning process, allowing students to see the average time they spend interacting with textbooks, the percentage of pages annotated, glossary terms mastered, and so on. 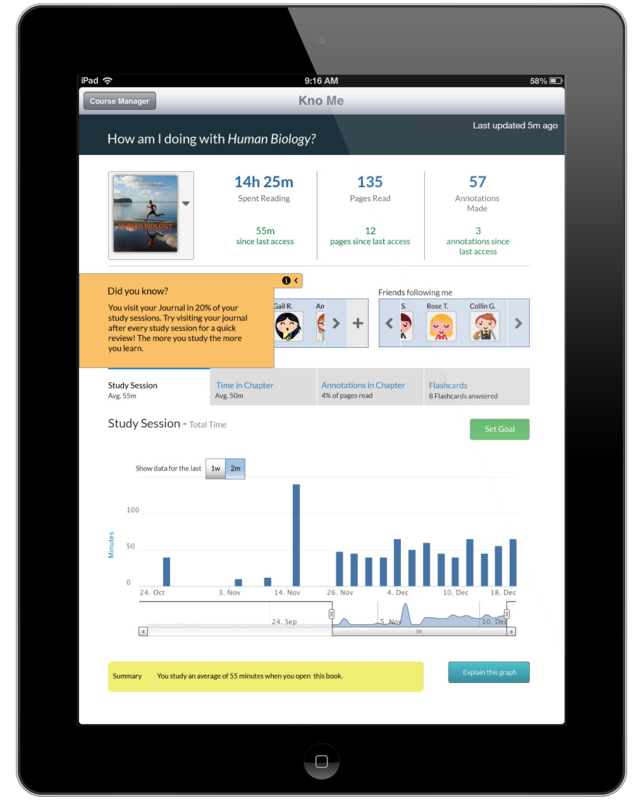 Kno Me is now available on all Kno interactive textbooks for iPad, Windows 8 and web browsers and will soon be available for Android and Windows 7. And, for good measure, Pathbrite — the educational portfolio startup that allows students and teachers to collect, organize and present their learning achievements, course completion and so on — also got in on the action today, announcing a new product and a new agreement with textbook behemoth Pearson. As a result of the partnership, the startup will be integrating its portfolio platform into Pearson’s personalized learning environment, now used by more than nine million students each year. It’s a big win for the young edtech startup, giving it access to a huge new audience.